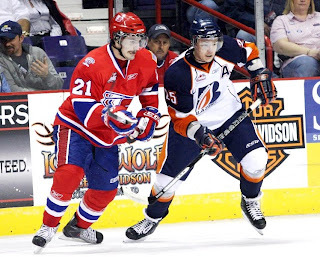 Recently the Spokane Chiefs rolled through town and with them this year is one of the most divisive players in the WHL. Kyle Beach is a player with followers in one of two camps: haters and believers. Every season Beach comes to Edmonton and he's wearing a different jersey and each time I make a point of speaking a few minutes with him. This trip through was no different and I was able to catch up with Beach for about 10 minutes prior to the game against the Oil Kings. The photo above was taken during this very conversation; that would be Beach on the left (mustache is for 'Movember', a charity tradition to raise money for cancer research) and my ugly mug on the right. The picture was snapped by Gary Peterson who was along on the Chiefs' trip through Alberta and is compiling the photos he took into a keepsake collector's photo journal that will be a must-have for Spokane fans. Keep your eyes out for it! As for Beach, I've been able to carve out a decent enough rapport with him over the last few years that I'm sure he knows to expect to see me at the rink for our regular pre-game chat. His first time through Edmonton was with Everett and he scored one of those classic "scoop from behind the net and tuck in under the cross bar" goals. We turned that interview into a feature on the radio show combining comments from his Silvertips coach of the time, John Becanic. You can Hear that one by clicking HERE. His next visit to Rexall Place was with the Lethbridge Hurricanes after a WHL trade deadline deal took him to the Alberta city. We chatted about that and also about his reputation that was continuing to dog him. You can hear that March 2009 interview by clicking HERE. And that brings us to this year. I started this conversation off by asking him about fitting in with a dressing room full of guys who used to have a first rate hate-on for him when he was with the arch-rival Silvertips. I was going to use Mitch Wahl by name but I think Beach knew where I was headed and decided to tackle that answer on his own. "It's definitely been interesting... me and [Wahl] always had a battle within the game and now him and I are pretty much best friends. You can look at Ryan Letts who jumped me a couple of times and every time I was on the ice he was all over me... we're great buddies now, I mean we've even had a couple sleep overs!" I'll admit i was struggling to keep a straight face when he said that and you'll here him chuckle a bit too, I think because he realized how awkward that statement sounded. "I think teams have tried to add me as a piece of the puzzle to make a run and unfortunately that didn't quite work out in Lethbridge but... we already have a great team here but if we can add one of two more pieces we'll be golden. Everett kind of rebuilt last year, got rid of me and got some great prospects. Lethbridge now rebuilding this year, traded me and got two very good defencemen, you look at what they've done and they've helped that team a ton." I decided to lighten things up a bit by pointing out another difference so far this year: that he hasn't been suspended yet. "[laughing] no, not yet... it's been a nice surprise actually!" The interview always eventually gets to his past reputation but Beach says things are different now and listed a few reasons why that is, including having a guy like Ryan Letts on his team and simple maturity on his part. "I'm growing up. I'm 19 now so there's no excuses. chicago's given me pretty strict guidelines... changing and maturing happens with age and now I just have to keep working on that and hopefully I'll win a couple more refs over." Since he mentioned Chicago, the team that drafted him, I figured it was time to take the conversation in that direction. Some of you will recall that Beach joined Chicago's AHL affiliate after the Hurricanes were eliminated from the playoffs last Spring. His stay in Rockford was a short one as both he and fellow Hawks prospect Akim Alui were sent home for disciplinary reasons. Shortly after, former Lethbrdige GM Roy Stasiuk revealed on our show that the Blackhawks had sent the pair home for... a food fight. I asked Beach when the last time he had gotten into a food fight was, hoping for at least a small comment on the incident. Instead... I pretty much got a play-by-play account of the scene. "It was a weird situation; there were three of us... Logan Stephenson, Tyler Mosienko and myself plus Akim Alui were all sitting there and we were debating which league was better: the OHL or the WHL. It was 3 against 1 and Aliu wasn't too happy so he dipped a napkin in teriyaki sauce and threw it on me. I grabbed one of those mini corn on the cob, threw it back at him and it escalated from there... and I got a full plate of food covering me head to toe in teriyaki sauce. I think we almost fought in the parking lot too..."
Naturally my follow us was to ask what the relationship is now with Alui especially after coming together again at training camp in the fall. I don't want to spoil it here so I'll let you hear what Beach said in regards to Aliu, his full account on the food fight and how things stand with Chicago these days. You can here the entire interview with Kyle Beach by clicking HERE and believe me... I highly recommend listening to this one, it still seems almost unbelievable to me. I also talked to Spokane head coach Hardy Sauter about Beach and how he's fit in. Sauter admitted he had some concern ealry on considering Beach's history and reputation but made a point of stating that the player has been anything but a problem in their room or on the team. I asked the coach if he felt that Beach has been unfairly labeled as a delinquent and subsequently black balled by organizations like Hockey Canada (who haven't even called to ask the coach about Beach this year!). Sauter told me that he felt the criticisms directed at Beach early on in his WHL career were "fair" but again pointed out that the player has matured and there hasn't been a problem with him whatsoever this year. I also asked Mitch Wahl who confirmed that he and Beach have become friends. Wahl described Beach as a person and player who every team in the league (and their fans) might hate but all of them would love to have him on their roster... once they got to know him. The Pipeline Show has always been willing to give Beach the benefit of the doubt; both Dean and I feel that Hockey Canada has been hypocritical in their obvious disdain for Beach while at the same time have opened their team to a player like Steve Downie. Both of us have taken some heat and ridicule for our support of Beach but honestly, we don't care. We see a player who as a youngster, possibly crossed the line of good sportsmanship [Lucic], wasn't afraid to stand up (with others) for his beliefs while with Hockey Canada [U17], plays on the edge with an intent to drive opposing players bananas and has a boat load of ability to play the game. Beach currently has 19 goals in 22 games, the second best scoring per game ratio in the league behind Swift Current sniper Cody Eakin. He is second on team scoring behind Mitch Wahl who has a single point more than Beach but with 2 games more under his belt. The fact that he was not invited to play in the Subway Super Series is an obvious declaration from Hockey Canada that despite his talent and value, Beach shouldn't expect a call for the December evaluation camp. And that is just a shame. Maybe Hockey Canada should follow Beach's example and show some growth and maturity of their own. Last week the Oilers signed Torrie Jung to an amateur tryout contract because they didn't have a back up goalie when Nikolai Khabibulin went down in the afternoon. What the LA Kings did today is even more peculiar, and terrific for one of their prospects. The Kings drafted Brayden Schenn 5th overall last June, and tonight he'll suit up with them in Vancouver after signing a one day contract with LA. The timing is perfect as Schenn was in Victoria last night for the Subway Super Series on Rogers Sportsnet. Rich Hammond has more on what this could mean down the road for Schenn here, which may ultimately be bad news for his junior team the Brandon Wheat Kings - hosts of The Memorial Cup this year - and Team Canada at the World Junior Hockey Championship this December in Saskatoon/Regina. The Oilers have recalled centre Ryan O'Marra for a second stint with the big club, and he's brought along his partner in checking Colin McDonald (pictured). 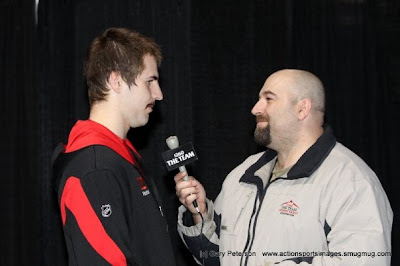 The pair have been the Springfield Falcons shut down line on the farm and have developed some nice chemistry. This will be O'Marra's second call up this year, you can read about his first stint here. If McDonald gets into game action it will be his first in the NHL, and proof that the Oilers might be salvaging what was once thought to be lost career. The Hartford product was a scorer before attending Providence College where the offence was sucked out of him, never registering more than 13 goals in a single season. His AHL career wasn't much better until Springfield Head Coach Rob Daum asked him to play a checking role, a role in which McDonald thrived in, starting with the final stretch of last season. With a defined job, McDonald's offence is starting to show signs of life. His 5 goals in 21 games, puts him just 7 shy of his career high. O'Marra and McDonald sit 5th and 6th in Falcons scoring right now. It's unfortunate that injured forward Chris Minard misses out another chance to join the Oilers. Charles Linglet, Colton Fretter and Chad Wiseman are all above or near a point per game pace, but will have to wait for their turn, which by the way the Oilers are getting hurt might not be that long. The interesting transaction in this announcement is that Liam Reddox has been "loaned" to Springfield. I'm not sure why, maybe it's to circumvent the waiver process or just another way to say 'sent down'??? While this is great news for O'Marra and McDonald, it means the Oilers must start scrambling to find capable players to fill out Rob Daum's roster in Springfield. There are a lot of really good scouting services out there - as well as a few shady ones - but the agency that gets people the most excited, is also the one endorsed and ran by the league. 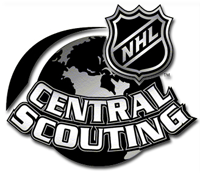 NHL Central Scouting started 33 years ago, and for some it's the bible of the scouting world. If that's the case then we were blessed by an almighty presence Tuesday night on TPS. Okay, that's a little much, but E.J. McGuire, central's head man, does carry a lot of weight when it comes to deciding the future of young hockey players. McGuire joined us after watching Kitchener battle London in the OHL and we started our conversation with him about the top two dogs in Ontario, Taylor Hall and Tyler Seguin. When the year began Hall was the top ranked player and consensus first overall pick by most people. But when central's November rankings came out the Windsor Spitfire was #2 behind the Plymouth Whaler Seguin. Expect the duo to flip flop the year before, and McGuire says if you like them in the OHL, you better get to see them this year. "There were 6 this year who jumped from the 2009 draft into the NHL draft, there were 11 from the year before, and these two - Hall and Seguin - will be on NHL teams come October of next year." Cam Fowler (Windsor) and Erik Gudbrandson (Kingston) are next in the OHL rankings followed by Barries Alexander Burmistrov. The next Canadian forward on the list is Sudbury's John McFarland. I was really impressed with McFarland during the Subway Super Series on Rogers Sportsnet, especially the way the 6.0 200 lb forward used his big frame. "Strong on his skates," McGuire began before adding McFarland has missed time due to injuries this year. Missing action has been a common theme for a few players this year, as Guy pointed out Brett Connolly (Prince George), Joey Hishon (Owen Sound) and Kirill Kabanov (Moncton) are all out of their respective line ups. McGuire explained how central deals with evaluating injured players. "We try not to drop them in the ratings, we try to grab viewings and hold to those kind of principals. But it's tough when the other guys are scoring hattricks right before your eyes." The Moncton Wildcats owns the top 2 QMJHL players ranked by central scouting as well as the number one slotted goaltender Louis Domingue. While the injured Kabanov is #2, defenceman Brandon Gormley is projected to be the top Q player selected in this Junes draft. Gormley starred for Canada at the Ivan Hlinka tournament this summer and McGuire made a lofty comparison to the rearguard. "To maybe compare him to other years, he might be in the category of Victor Hedman." McGuire qualified the comparison by saying Gormley is a few inches and pounds shy of Hedman, but that their offensive instincts are similar. Another defenceman getting rave reviews from McGuire is Edmonton's Mark Pysyk, mostly because of his skating. EJ agreed with Guy's comparison of Pysyk to John Moore drafted in the first round by Columbus last season. From the blueline to the last line of defence, we talked goalies. McGuire made it clear that he doesn't pretend to be a pipeman expert, but defers to central staffer and former Washington Capital Al Jenson. There are 3 goalies garnering a lot of attention right now. Calvin Pickard (Seattle), Louis Domingue(Moncton) and Jack Campbell (US National Development team). "Those will be 3 goalies for the first time that will probably sneak into the mid to later part of round number one, and that hasn't happened in a couple of years"
After our conversation with EJ McGuire we had a short discussion about Jack Campbell and how according to Western College Hockey Blog, he'll be jumping ship to Windsor next year rather than attending Michigan, which would be following a Wolverine teammate who just left the den for the OHL. You can hear the entire conversation by clicking here. One of the guests that we were pleased to speak with on the program last night was an old favorite of ours, Sam Cosentino. You know him from Rogers Sportsnet where he's on both the baseball and junior hockey broadcast teams and obviously we were speaking with him about the latter. Cosentino has a passion for junior hockey just like we do but has the advantage of covering all three CHL leagues on a first hand basis. That's why we enjoy having him on as much as we do (which is still not frequently enough for us or for him). Yesterday we were able to pick his brain about the ongoing Subway Super Series and got his scouting reports on CHL players, the Russians who made it over, the Mike Liambas suspension and what the difference is in the case of Zac Rinaldo plus... I got to throw my alternative to today's Super Series at him. We started by asking Sam to offer up the names of some of the players that have caught his eye over the first four games of the series (QMJHL and OHL). He started with the Russians and offered some comments on a few of the imports who are actually playing in the CHL including Dmitri Kostromitin who was an invite to Oilers rookie camp in September. However, it was 2010 eligible Maxim Kitsin that scored the best praise from the TV colour analyst. "I think he's been fantastic, probably their most consistent goal scoring threat." Cosentino continued to comment on Pavel Lukin and Dmitri Kugryshev. On the CHL side of things, Cosentino suggests that Taylor Hall and Nazem Kadri were two key guys for him to watch. Out of the QMJHL he made special mention of Luke Adam and Gabriel Bourque. From the WHL the guys he says he is looking forward to seeing in action include TPS Guest Player Blogger Brett Connolly of the Prince George Cougars, Edmonton Oil King Mark Pysyk and Jordan Eberle who wowed him earlier in the day at practice. "[Eberle] was tearing apart the shootout portion of the practice." Dean then brought up something he has noticed over the first few games of the series in that the CHL clubs have featured a couple of interesting lines. In the Q games we saw an all-Rimouski combination in Jordan Caron, Patrice Cormier and former Oceanic winger Philippe Cornet (#15 above). 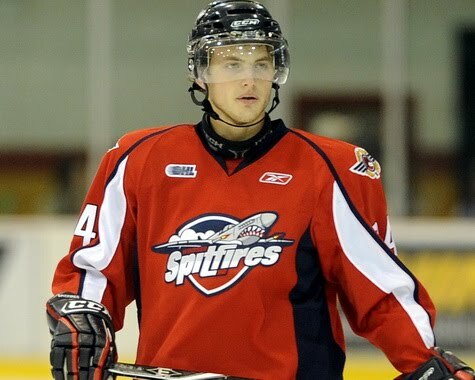 There was an all-Spitfires line in the OHL games with Taylor Hall, Adam Henrique and Greg Nemisz. Millard asked Cosentino if he felt this was something that might carry over to WJC camp. "When you look at the chemistry that those two lines have had you can't help but look and say 'boy, if we bring these guys to the camp and they can compete in the red/white events and on an individual basis maybe it is plausible that we keep these guys together come tournament time." That led into a question on Oilers prospect Philippe Cornet who, despite a pile of points and an impressive Super Series, both Dean and I get the impression from Hockey Canada that they might be look warm to him. Cosentino had a different perspective. "Smart player. Really smart player and I don't necessarily think I agree with [our] assessment. I've been sneaking around with coaches and scouts and I think they were particularly happy with his game. I thought Cornet played both ends of the ice extremely well, positioned himself great, had some good back tracking and defensive plays coming back into the neutral zone. I liked his game and I think [Hockey Canada] is probably a little more than 'luke warm' based on some of the people I've talked to." I asked Sam if there was a player he felt had earned a camp invite with the way he performed during the series and he suggested a player from the QMJHL fit the bill. "I think Gabriel Bourque is that guy for me right now. He was awesome in the two games; great energy, has no issue at all getting involved physically, able to put up points but able to be the pain in the rear end guy." Sam offered up a few other names as well during the first segment of our conversation. We then directed an email question Sam's way which asked about suspended London Knight Zac Rinaldo who was somehow eligible to still partake in the Super Series. We ended the first segment with that question and when we came back from a commercial break we picked up right where we left off and asked Sam to comment on Rinaldo's history of suspensions in light of the career ending suspension handed out recently to Mike Liambas. "I'll be perfectly honest with you guys... I think the [Liambas] suspension was too long." Sam went on to clarify his position on that incident and what he would have liked to have seen as the penalty and made a solid explanation as to why he's taken the stance that he has. 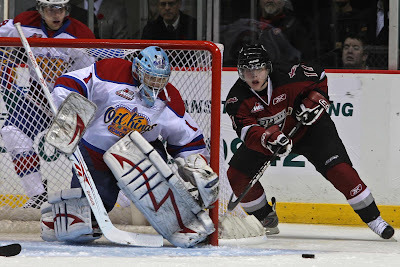 Dean made a great point that, with just two goalies playing for the WHL in the next two games of the Super Series, it's clearly Martin Jones VS Calvin Pickard (above) for Hockey Canada in terms of a camp invite. Cosentino agreed and went on to describe how he envisions the goaltending battle shaking down in advance of the World Junior Camp. "Jake Allen - invite. After that it kind of breaks down a bit. The next guy I have on my list is Matt Hackett of the Plymouth Whalers. The last two camp spots if they go with four goalies... is a fight between the two WHL guys, Pickard and Jones, and I would throw Louie Domngue of the Moncton Wildcats in that group based on how well he played at the Ivan Hlinka tournament." Edmonton fans will notice that summer camp invitee Olivier Roy doesn't make the cut for Cosentino (nor for Dean or I as far as that goes) based on a weaker season than the others on the list. "He's a guy that I really thought going into this year, would be a cinch to make one of those four spots but I'm not so certain of that now." We then brought up the name of Kyle Beach and whether Sam was surprised that the power forward isn't playing for the WHL after finally getting that chance last year. "Yeah a little bit, I mean, he's lighting it up right now. This is a guy that, let's face it, they are very familiar with." Cody Eakin has been a scoring machine this year and Dean wondered if the Swift Current sniper might be this year's Jamie Benn or Brett Sonne. "I think he can be that guy to play the role where he's needed to go out and create an opportunity or get a couple of good shots but also to play a defensive posture." Finally, I pitched my idea to Sam about having the Russian component in the Super Series changed to a European/American squad from the CHL. Although he liked the idea in theory, Sam pointed out that in the end, it's money that dictates the structure of the event. "To this point guys, it's selling. Would you like to see better competition if you're Hockey Canada? Yes. For Television? Yes." Sam's point was that because the advertising around the event is sold out, there is not indication that a change is needed and that in fact, removing the Russian aspect from the Series might have a negative effect on sponsorship. "I love the idea of the international [roster] event but it would take a huge marketing endeavor to try and sell that. Believe it or not, when you go around, Canada vs Russia still sells." Sam's counter proposal would be to have a series that would pit the QMJHL against one of the Eastern based NCAA Conferences like the ECAC. The OHL could play the CCHA and the WHL would square off against the WCHA. I am not sure that NCAA regulations would even allow such an exhibition though. It was a very informative and entertaining double-length interview with Sam which you can hear by clicking HERE. Last year three 17 year olds were cracked Canada's World Junior roster that won a 5th consecutive gold medal. They were Ryan Ellis, John Tavares and Evander Kane. 3 more were invited to the December camp, along with 2010 eligible player Taylor Hall. Hall is a no brainer for this year's club. Here are 5 other underaged players who - according to The Pipeline Show - have a shot at atleast getting invited to camp, along with one wild card selection and a goalie. This is my wild card and long shot, as RNH isn't draft elible until 2011. But that was the case with Taylor Hall last season. The former first overall bantam pick has been lights out with 27 points in 25 games this year in Red Deer. 13 of his points have been goals. The Burnaby boy is already being pegged as a possible first overall pick in the 2011 draft, and while he hasn't been as dominant as guys like Hall, John Tavares or Steven Stamkos were as 16 year olds, he is very good. He has the 9th best goals against average on the 3rd worst team in the WHL. Calvin Pickard is the younger brother of former Tri City netminder and Nashville first rounder Chet, who played for team Canada at the WJC. Some think he'll out grow Chet's shadow, and become an even better goaltender. Canada rarely takes an underaged goaltender, but could it really hurt to invite him to camp? He has past experience having suited up for Canada's U-18 squad. If he stands out in the upcoming WHL-Russia games during the Subway Super Series he has a chance. 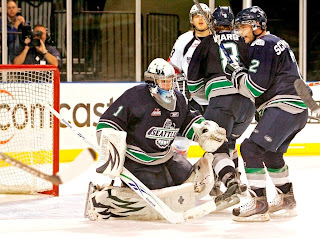 Ironically he's playing with Martin Jones who was the only WHL goalie invited to the summer camp. 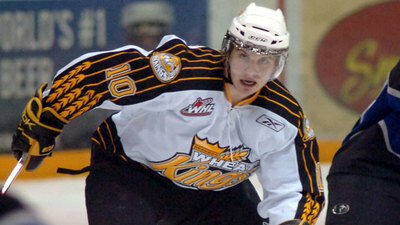 If you don't know Pysyk, meet Mr. Everything for the Oil Kings. He quarterbacks the power play, kills penalties and neutralizes the oppositions best players, and he did all of that last year as a 16 year old. Pysyk for my money is the team's most important player. He's just 7 points shy of matching his total from last year. The only aspect of his game that isn't there yet is a nasty edge, and I'm not sure it will ever be there. Gormley is a lot of things that Pysyk is, but according to one scout I spoke with, is a new notches above because of his better offensive ability. His 27 point total will be surpassed this season for the Wildcat defender. Gormley was Canada's top blueliner at the Ivan Hlinka tournament this summer, notching 3 goals and adding as assist in 4 games as Canada captured the gold medal. If Canada takes an under age blueliner, the 10th leading scoring defenceman from the Q will get the call. He tried to get special status to play as a 15 year old, but was denied by the OHL. However I don't expect the Sudbury Wolves forward to suffer the same fate from Hockey Canada, atleast when the camp invites go out. 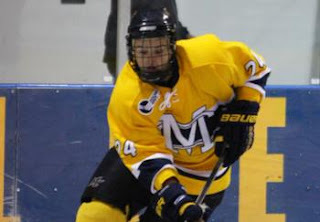 Sudbury drafted McFarland first overall and he notched 52 points as a rookie last year. I like his size and skill, and while he likely won't crack the final roster, he should be at camp. The CHL's reigning rookie of the year, who notched 30 goals and added 30 assists isn't having the start to the season he was expecting. A hip problem has limited Connolly to just 7 games this year and he hasn't played since October 3rd. He did have 6 points in 7 games, which is pretty good for a guy playing through an injury he suffered at the Ivan Hlinka tournament. When healthy he's a dominant sniper, and if he returns in time, it'll be hard for Hockey Canada to ignore. When Dana Tyrell was injured last year, at Canada's selection camp, and didn't return to Prince George, Connolly actually became a better player. He's fast, tenacious, and highly skilled. He's also overtaken Taylor Hall for the 2010 draft according to NHL's Central Scouting. The Plymouth Whaler was neck and neck with Hall for the OHL scoring lead early in the season, but a hip flexor cost him 6 games. However he's back now and it will be hard for Canada to ignore when the final cuts come. Seguin could end up as a rarity, of getting cut this year and not being available next year because he's in the NHL. The same thing happened to Matt Duchene who cracked the Avalanche and Michael Del Zotto who's starring on Broadway with the Rangers this year. Of course not all of these guys will get invites, but some of them will and a couple could crack the final roster. We'll be discussing this and a lot more tonight on TPS with NHL Central Scouting's EJ Mcguire and Rogers Sportsnets Sam Cosentino. Also scheduled to join us is Spokane Chief and the anti Hockey Canada player Kyle Beach, Flyers rookie James van Riemsdyk, and Alaska Nanooks head coach Dallas Ferguson. 7-9 PM MST on the TEAM 1260 in Edmonton or online at www.thepipelineshow.com. 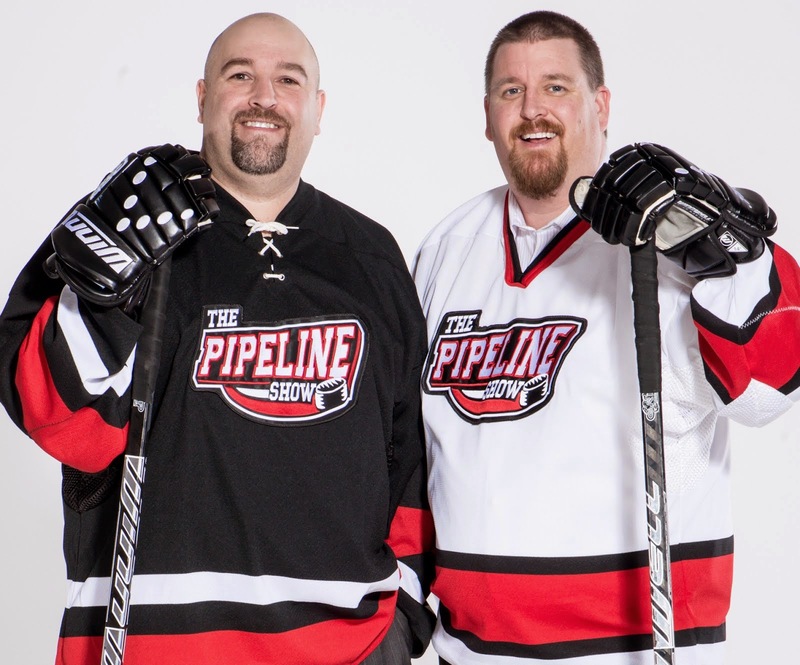 Drop us a line at pipeup@theteam1260.com. About 2 and a half weeks ago, I wrote something about Humboldt Broncos Head Coach Dean Brockman getting an interview with the Kamloops Blazers. In an blog post by Gregg Drinnan from Taking Note, Kamloops G.M. Craig Bonner laughed it off, and even had this comment. I haven’t talked with anyone, I have emailed a few people back telling them we’re going to give these guys a chance here for a bit and see how it goes. So, when I heard today's announcement that Kamloops has hired Guy Charron, it tells me that Bonner wasn't being entirely truthful in his response to my blog. 18 days after he says he isn't planning on talking to anyone about the job he hires someone??? As for Charron, he brings a wealth of experience from the QMJHL, AHL, and as an assistant in the NHL, and should give a boost to a Blazer team with 3 wins in their past 10, and an 8th place sitting in the western conference. I find it interesting that Charron's contract only covers the rest of the season, leaving the door open for Kamloops to go in a different direction next year, like say... Dean Brockman. There have been a lot of interesting story lines in NCAA hockey this year; the return of former powers to their past heights, the tumble of the defending champions and several other perennial favorites plus the rise of a few upstart programs. The Merrimack Warriors fit that latter description to a tee. Head coach Mark Dennehy is in his 6th season as a head coach, 5th behind the bench at Merrimack. The Warriors went 12-18-4 in 2007-08 and that is the best year Merrimack has seen under Dennehy, by a long shot. Last year the team won just 9 of 32 games and that's equal to the wins in Dennehy's first two years combined. Merrimack was less than a weak sister in the powerful Hockey East Conference, they were an after thought. The free space on the Bingo card. Merrimack's last season where they finished with a winning record came in 1988-89 (.794%)... when they were still a Div II program. Since joining Hockey East the next year, they've been fodder for the likes of BU, BC, Maine, UNH and pretty much everyone else in the conference. But this year... might be different. The Mack started the year tough, on the road in North Dakota where even the best NCAA clubs aren't going in as the favorite. The Warriors dropped the opener 5-2 but came back stronger and although they lost the rematch, it was by a narrow 3-2 margin. Since the opening weekend the Warriors are a respectable 6-3 with wins coming against Vermont (5-2), Boston College (5-3) and defending champion Boston University (6-3). It's not all rainbows and and lollipops for the Massachusetts based program but they are on pace for 16 or 17 wins and that would be the best Div I finish for the Warriors since the 16-win campaign in 1993-94. While the Warriors are currently unbeaten at home they are also winless on the road - that will obviously have to change... won't it??? One of the reasons Merrimack is off to a promising start is due to recruiting. Coach Dennehy and his staff have had to beat the bushes more than most teams in the Conference but they've managed to lure some interesting players to the program. 12 of the 28 players on the roster are Canadian but before you jump to the very natural conclusion that the Canuck content is the lone reason for the improvement consider this: The team's leading scorer is an undersized native of Paris, France who played 3 years in the USHL (Stephane Da Costa). The team leader in assists (Joe Cucci) is a finance major from Melrose Park, Illinois. There are a few names that might ring a bell with hockey fans in Western Canada and specifically in AJHL territory. There are 7 former AJHLers on the squad including a trio of Camrose Kodiaks - forwards Chris Barton, Jesse Todd and defenceman Karl Stollery (pictured above). One freshman on the team this year originally hails from California but joins the program by way of the Vernon Vipers of the British Columbia Hockey League. The Vipers are the defending Jr. A National champions in Canada thanks in no small part to the efforts of defenceman Kyle Bigos and that winning attitude appears to have followed him out East. Over the summer the 6'5 blueliner was taken by the Edmonton Oilers in the 4th round of the NHL Entry Draft, just cracking the top-100 as the 99th player selected. 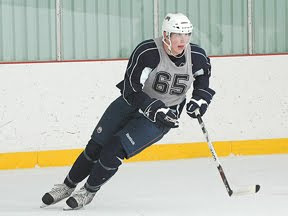 Bigos attended prospect camp in the Alberta capital in early July and that was where The Pipeline Show first met him. He's an imposing figure at 6'5 and around 230 lbs, you might be a bit leery of the man if not for the beaming smile that always seemed to be on his face. Not only was he outgoing and friendly but he was more than happy to chat about how he found his way to hockey in California, what led him to the BCHL and how he felt about being a part of the Oilers organization. We also talked about Merrimack and what drew him to the Warriors. At the time, Bigos was one of two Oilers prospects that we approached about contributing to our blog this year and the blueliner appeared genuinely enthused at the thought of it. The Pipeline Show: The last Oiler fans saw from you was at prospect camp in July. How did you spend the rest of the summer before heading down to Merrimack? Kyle Bigos: The rest of the summer I was training at a gym in Oak Hills, CA with TSR trainers and had a pretty progressive time with them. I was also skating a lot anywhere I could, but mainly at these two rinks in Ontario, CA where I grew up. I would go to a lot of beer league games as a ringer with a lot of other good players and play for free with teams that needed us. There was a bunch of Jr. A guys and some college players Div. I and Div. III. it was a fun time with all of us. I would also hang out a lot with my brother and family since I don't see them to often. 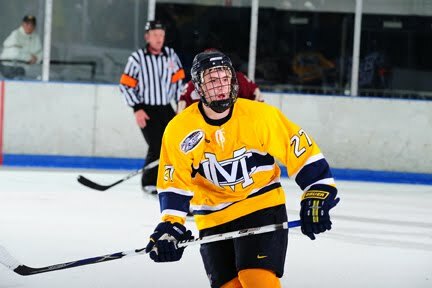 TPS: We've asked you this question before but knowing that there were a few different NCAA schools that had approached you this past season, can you comment on why Merrimack was the right hockey program for you? Bigos: Merrimack College was the right program for me because they came forward to me first. They saw my potential and found out about my character and work ethic and were willing to invest in me with a full ride,. I knew from talking to the players and the coaches that [Merrimack] was ready for something big and were getting the guys to do it, and that the culture [in the program] is perfect for developing players in all aspects of the game. Merrimack doesn't have the big name to it yet, which leads a lot of people to mistake it for a bad program and that's the biggest mistake. TPS: what are you studying? Bigos: Right now I am majoring in Business and taking the courses for that. TPS: we've spoken with a lot of players who went the college route and they all say that it took them some time to get comfortable fulfilling the demands on and off the ice. How do you balance academics with your hockey schedule? Bigos: At first it was pretty hard to juggle all the workouts, video, skill work, and ice time, but once you get into a grove with your studying and hockey its not too bad. I had to cut out a lot of down time to make it work, which isn't a bad thing at all, but it's certainly different than what I was used to in juniors. 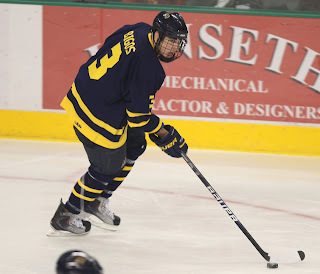 TPS: Merrimack is off to a pretty impressive start. It's still early but you've beaten some traditional HE powers in Vermont, BC and BU. To what do you attribute your team's early success? Do you feel like Merrimack is underrated and that you are catching teams a bit by surprise? Bigos: We're off to the start we wanted. We lost two games to North Dakota on the road, which were pretty tough to swallow as we were still trying to establish our identity and get our feet under us. But then we had the chance to get some teams at home and get going and then head back out to the road against some other HE teams. Our success comes from hard work and discipline; I've noticed that when we start trying to play fancy and trade chances we let other teams into the game. We can play that game, but we feel we are stronger and better than other teams when we play our puck possession game. Our road games we're losing by a goal or two, and have yet to break out of our shell and play our best but we're taking the steps to fix that. I feel we are underrated but since we do not have the big names like other HE teams we have to prove ourselves more than any other team which is fine by us... as long as we win. I don't think we're catching teams by surprise but I feel that we have a couple of huge pieces that we didn't have last season which is making us very effective and able to pull out the wins. TPS: There is a large Canadian Jr A contingent on your roster, especially with 7 AJHL guys. I imagine the team as a whole is pretty tight but do you have some inner Canadian/American friendly rivalries as well? Maybe play some inter-squad scrimmages for international bragging rights? If so... what side do you play for as an American that played in junior hockey in Canada? Bigos: We do have a lot of Canadian guys on our team and whenever we have the ice or time for ourselves we play U.S. vs. Canada (plus Da Costa!) . We have a great time doing this and it will always be for bragging rights. I played for team U.S.A. even though the captains told me I could play for either team but... U.S.A. was short on defense. TPS: As one of the older guys with the RBC Cup winners in Vernon last year (above) you were a key guy that the coach would play in every situation and you'd get a ton of ice time. I know at some NCAA programs, the ice time and roles are basically handed out according to seniority. 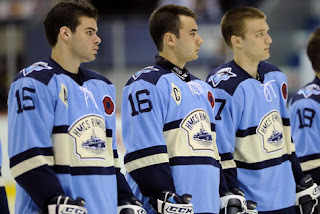 What's your role this year at Merrimack and is it different than what you were used to in the BCHL with Vernon? Bigos: My role on the team is to be as physical as I can and establish a presence on the blue line. I love to move the puck and and play 5-on-5 with the team we have, but I am also getting the opportunity to play on the PP. We have a couple different set ups but I am not the quarter back on them, I'm mainly just used as a shooter. I also get to play PK which is a blast! I think to go out and block shots and try and stop the talent filled teams in HE is a great challenge and a lot of fun. In the BCHL I would play a similar type of role, just a lot more put on my plate and more of the focus on me, but still an almost identical role here at college. TPS: Has there been much difficulty for you making that transition up to the NCAA level? What words of wisdom would you bestow on our younger readers who might be considering following the same path as you towards a career in pro hockey? 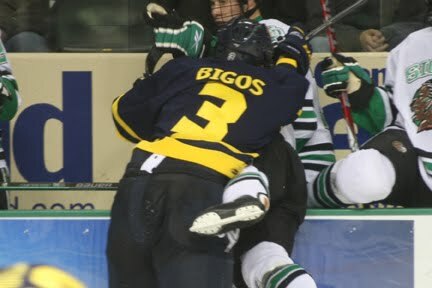 Bigos: The transition up to the NCAA level is what was expected for me. The speed here is very fast and the players are a lot stronger than juniors. Another big difference I found was just the way the players are so disciplined within their systems and that their abilities to read and react with the play is very good. All of these things stem from how hard you prepare yourself physically. I felt I had a good off-season and that I have had great improvement even with the team in the weight room and on the ice before the season started. When the season did start and I noticed all of these things, it was pretty easy to adapt. I'm still learning and working on the things I need to, and I feel I'm making good progress and being as effective as I can during the games. TPS: Who are you playing with on the ice? 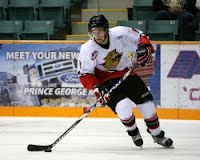 Bigos: My D-partner right now is Karl Stollery, from Camrose. He's a great guy- quiet but has a tremendous work ethic and is a great skater. We feed off of each other really well and I learn a lot from him. We click very well on the ice because its very easy to play with him. Our chemistry is very good so far and we're only getting better. TPS: When the team is on the road, who are you roomates with? Bigos: I'm roommates with Stephane Da Costa from France. He's a great guy and one of my best friends here. Off the ice he's a very, very funny guy and really down to earth. We always have a fun time and we get along great. I couldn't be happier with my linemate or roommate. TPS: finally, tell us a bit about Stephane Da Costa... a kid from France, has played last 3 years (maybe longer?) in North America and is having a big freshman season already including a huge 5-point game against Army back in October. Like I asked you in a text a while ago... is he for real? Bigos: Stephane is the real deal. He's just so smart with and without the puck and he has so much skill to go with it. He reminds me of a little kid around the rink; just so excited and eager to be there and ready to just get on the ice and work. Its something that everyone has in them but we sometimes tend to get away from it at the higher levels as you go up but he brings that to our team and its infectious. Our whole team is at the ice rink and on the ice as much as we can be and it's great. [Da Costa] is a great skater and great stickhandler and has good speed. He is so smart that its like he has such an advantage with his ability to see the ice and read and react. He controls the play so well as a puck possession guy and sets up so many scoring chances as well as score goals. He is very strong on his skates as well. I cant find anything bad about this kid every time I watch him. He's going to have a great career in the NHL. 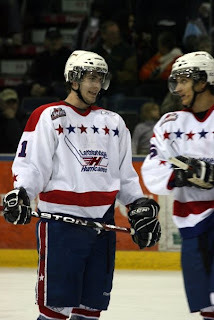 Kyle Bigos was a 4th round selection of the Edmonton Oilers in the 2009 NHL Entry Draft. 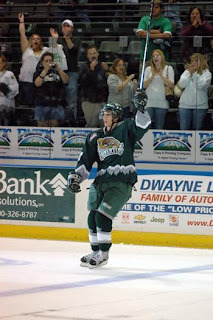 He scored 33 points in 58 games with the Vernon Vipers of the BCHL for whom the native Californian played two seasons. He is now a freshman member of the Merrimack Warriors and currently has 6 points in 11 games played with 32 penalty minutes and one game winning goal. There were big wins and even bigger losses this week in NCAA hockey but all eyes were on Magness Arena in Denver for the marquee match up between the #2 and #3 ranked teams in the nation. There will be movement again on the top 20 rankings, as there naturally is every week, but I found it interesting that on last week's USCHO.com poll, 5 of the top 6 teams received 1st place votes. I don't think that will happen again after what happened over the last couple of days. Here is a reminder of how the Top 20 looked before the games of the week, the number of first place votes in brackets followed by the results from this weekend. Miami has been the #1 ranked program since the results of the opening weekend of the season. The RedHawks have now played 6 of their last 8 games on the road and haven't lost any of them going 5-0-1 in that stretch of roadies. This weekend it was to Kalamazoo the home of the Western Michigan Broncos where Miami rattled off a 3-0 win on Friday and escaped with a 1-1 tie on Saturday. Goalie Cody Reichard had a fairly easy time of it having to stop just 15 shots for the shutout in the opener. Connor Knapp (BUF) had 30 come his way on Saturday and he stopped all but one of them. Saturday's affair saw much more shooting as the two teams combined for 73 shots compared to a total of 39 the night before. Andy Miele scored twice for the RedHawks on Friday and Saturday's lone Miami scorer was Carter Camper who ended a 4-game pointless slump but still has only hit the score sheet for 3 points in the last 9 games. Will Miami retain the #1 ranking? I think it will be a close vote but mine (if they let guys in Edmonton, AB Canada vote) would go to #3 Denver this week after they swept the #2 ranked Sioux of North Dakota. Last week I suggested UND would be my pick for top spot on the poll but they only received 2 votes (as did Denver). The Pioneers and Sioux have built up a pretty heated rivalry and there was no doubt that their meeting this weekend was the headlining tilt on the schedule. 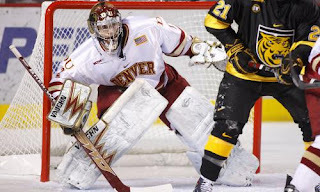 Denver came away with 1-goal victories on both nights, the first featuring a Marc Cheverie (FLA) 34-save shutout and the second ending on a last minute disallowed UND goal. Both teams recorded 34 shots in the first game with the only goal scorer being DU freshman Drew Shore (FLA). Shore's GWG came in the second period while on the power play, a theme for the rest of the weekend as every goal scored between the two clubs came with the man advantage. Saturday the Sioux broke out to a 2-goal lead as Danny Kristo (MTL) and Chris Vande Velde (EDM) scored first period goals. Denver answered back in the second frame with three of their own, Joe Colborne (BOS) scoring the first two and setting up the eventual game winner. North Dakota thought they had tied the game at the end while on the power play but the goal was called back after video review clearly showed that Brad Malone had kicked it in. Game 2 was filled with penalties, 20 combined for a total of 18 power plays. UMass-Lowell kept pace as best they could with only one game on their schedule. They doubled up on Merrimack 6-3 as the Warriors' Jeckyl and Hyde season continued; Merrimack is a perfect 6-0 at home and a perfect 0-5 on the road. The River Hawks went 3-7 on the power play and got a pair of goals from both Scott Campbell and Paul Worthington in the lopsided victory. Cornell will surely drop out of the top 5 after splitting their games on the weekend. The Big Red beat Princeton 5-2 on Friday but couldn't complete a comeback against Quinnipiac so lost 3-2 on Saturday. Blake Gallagher and Joe Devin each had 3 points against the Tigers who received both of their goals from senior Cam MacIntyre. #13-ranked Quinnipiac got out to a 3-0 lead midway through the game and held on for the win after Cornell scored twice in the final five minutes of regulation time. Cornell goalie Ben Scrivens allowed 3 goals on 19 shots. I would expect the Big Red and the Bobcats to be ranked much closer together as a result of Quinnipiac's road win. Michigan State and Notre Dame tied 1-1 on Thursday night and then waited two days for the rematch on Sunday. The Irish took it to the Spartans on Sunday, at least on the score board. MSU held a 28-16 lead in shots but could only put one past Brad Philips in the Notre Dame net. Calle Riddewall, Bill Maday, Kevin Deeth and Kyle Lawson all had two points for the Irish. Thursday's tilt ended in a shootout "win" for Notre Dame - an extra point in the standings but still called a tie. Colorado College should move into the conversation for top-5 status after a pair of wins over a challenging Robert Morris. The Colonials may be just 1-8-2 this year but they gave CC all they could but still suffered 4-3 and 4-1 losses. Colorado College recorded 90 shots over the two games and got 6 different shooters with Billy Sweatt (CHI) and Mike Testwuide potting a pair each. The top club from the 4-team CHA Conference is the Bemidji State Beavers and they continued to roll after sweeping Alabama-Huntsville scoring 12 goals in the process. The Beavers hammered the Chargers 6-1 and 6-3. I expect the #9 Yale Bulldogs to slip some more in the poll after losing to #11 Massachusetts 4-3 in overtime on Thursday night. James Marcou's winner came at the 3:59 mark of the extra period and completed the comeback after the Bulldogs blew a pair of leads in the game. It was the only game of the weekend for the Minutemen but Yale was able to bounce back with an overtime win of their own over cellar dwelling Brown. The last place Bears were down 4-1 after the first period but clawed their way to extra time where Broc Little came up big for the Bulldogs. Alaska-Fairbanks had a tough time with another middle of the pack CCHA team as they split against Lake Superior. The Lakers took away the win on Friday in part because of a pair of goals from Canadian born co-captain, Rich Schofield. The Nanooks barely avoided the upset sweep by staging a comeback from 2-0 to steal Saturday's rematch by a 3-2 final. 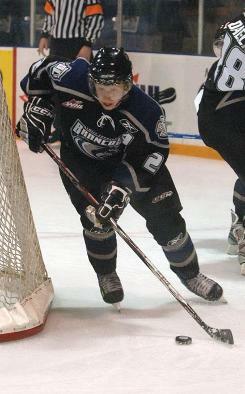 Former AJHLer Dion Knelson scored twice in Alaska's win. The Michigan Wolverines were upset at home by Bowling Green on Friday, their 5th consecutive loss, but were able to stop the free fall with a 4-1 road win in on Saturday against the Falcons. Bowling Green went 2-3 on the power play and scored 3 times in the final period to stun the faithful at Yost Ice Arena. The three strikes came less than three minutes apart, the first during a 5-on-3 man advantage. Michigan replied though on Saturday holding BG to a total of 12 shots (despite 5 power plays). The Wolverines got 3 points on the weekend from Louie Caporusso (OTT), who had been held off the score sheet in 7 of Michigan's 10 games prior to the weekend. #17 Boston College beat and tied Maine which should be enough to move out of their poll ranking tie with idle Vermont. The Eagles downed the Black Bears by a 4-3 score on Friday and came away with a 3-3 tie on Saturday. Another heated WCHA rivalry was featured this week as State foes Minnesota-Duluth took on the Minnesota Golden Gophers. The Bulldogs escaped Mariucci Arena with a pair of road wins and will surely improve on their #20 ranking as a result. Travis Oleksuk's overtime marker sealed the game on Friday for Duluth while Saturday's 3-2 win featured a pair of assists from freshman Dylan Olsen. Both games saw the Gophers break out to 2-0 leads only to gas them in the end. The team with some serous momentum right now is Ferris State who are a perfect 8-0 at home and have only dropped 2 of their last 12 games. The CCHA Bulldogs embarrassed Ohio State 8-1 on Friday night, 24-year-old senior Blair Riley scored three times for the home side. The Buckeyes blew 3-0 and 4-1 leads on Saturday and eventually coughed up 6 goals to the Bulldogs who preserved their unblemished home record with a 6-5 overtime win. My Top 20 for next week: (1) Denver, (2), (3) North Dakota, (4) UMass-Lowell, (5) Colorado College, (6) Bemidji State, (7) Michigan State, (8) Quinnipiac, (9) Cornell, (10) Alaska, (11) Notre Dame, (12) Massachusetts, (13) Yale, (14) Wisconsin, (15) Minnesota-Duluth, (16) Nebraska-Omaha, (17) Boston College, (18)Michigan, (19) Ferris State, (20) Vermont. The Portland Winterhawks sit 2nd in the WHL's U.S. division and 3rd in the Western Conference overall, and today traded their number one goaltender Kurtis Mucha to the Kamloops Blazers for a 4th round pick. 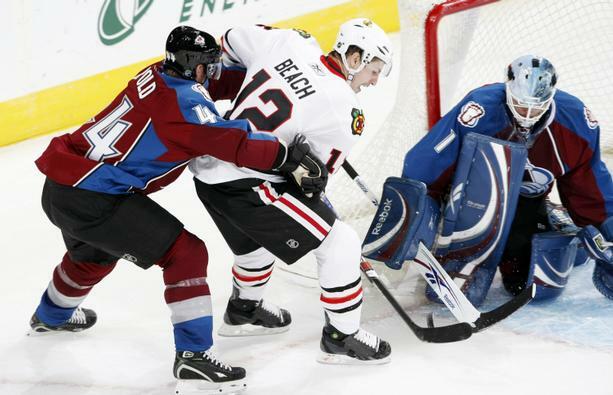 The Hawks are enjoying a rebirth on and off the ice this year, and Mucha was a big reason why as far as I was told, but this deal allows them the ability to add an overage skater. The Hawks only fly through Edmonton once, and when they did I was impressed. Portland Head Coach/G.M. Mike Johnston must have a ton of faith in 19 year old Ian Curtis, who's appeared in 12 games with a 7-3 record, a 3.33 GAA, and a .905 save percentage. Portland also has 17 year old Mac Carruth out of Minnesota to plug in between the pipes, but one has to wonder if either of them are up to the task of carrying the team into the playoffs. For Kamloops, Mucha gives them a credible last line of defence, which is clearly needed for a team that's given up 122 goals this year, the most of any WHL team. That they only gave up a 4th round pick for the Sherwood Park pipeman doesn't hurt them at all. This trade is interesting for a few other teams as well. Will Seattle send 20 year old Prab Rai who has 13 goals and 25 points in 24 games to their U.S. division rivals? 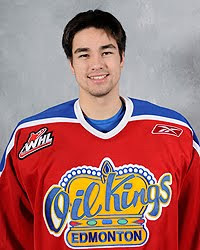 Recently Guy thought out loud about the Oil Kings dealing Torrie Jung. It's a thought I've heard from a few other people as well. If the price is a mid round pick, is it worth trading the most important position on your team for a 4th round pick? The Oil Kings might be able to get away with it because they have Cam Lanigan waiting in the wings to take over from Jung. But it will be very interesting to compare the Blazers and Winterhawks the rest of the way. After a a serious knee injury wiped out the second half of his 2008-09 season likely leading to a slight drop at the NHL Draft, Jared Cowen is doing everything he can to prove his real worth. Spokane was recently in Edmonton to take on the Oil Kings and I had a chance to speak with a few of the players including Cowen, the captain of the Chiefs. Last year began about as good as he could have hoped for; Cowen was ranked as a top-5 prospect, the top blueliner available from North America and second overall behind only Victor Hedman. He was coming off a Memorial Cup win where, as a 17-year-old, he was one of the best defencemen in the tournament. The dream season took a hit in December when his name didn't appear on Hockey Canada's invite list for the final World Junior selection camp. In hindsight, you can't really say Hockey Canada made a mistake because they went to Ottawa and captured their 5th straight gold medal. However, Cowen's omission did raise a few eyebrows when the camp list initially came out. Not being able to partake in the WJC tournament was a negative for a player so highly touted during his draft year. Things went from bad to much worse shortly after the CHL/NHL Top Prospects Game when Cowen sustained a knee injury against the Chilliwack Bruins. Cowen suffered "an MCL sprain and a high grade injury to his ACL" and missed the rest of the regular season, the WHL playoffs and he was limited to near-observer status at the NHL combine. He was still drafted very early in the NHL event but did not go in the top 5 like most predicted he would earlier in the season. Eventually he fell into the lap of the Ottawa Senators in the 9th position who, according to Tim Murray, were expecting to choose a forward. 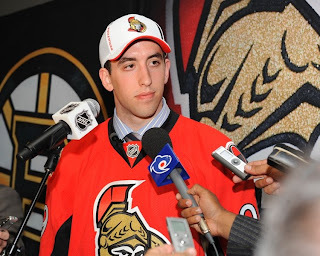 The draft day results received mixed reviews from Cowen who was pleased with who took him but clearly disappointed that his stock did slide a bit because of the inactivity. "Even though I was injured it was kind of nice to end up going to a Canadian team," Cowen said, "If I hadn't of been injured I think I probably would have gone (earlier) to somewhere in the States but that's fine. Staying in Canada was probably the best thing that could happen so in hindsight it was kind of a good thing to have [the injury] happen." Off season training took on a different meaning as it wasn't just about knocking off the summer rust but in rehabilitating the knee and preparing for a NHL camp. When the time came, Cowen admits he still wasn't 100%. "It was a different than what most guys experience because everyone else there was healthy except for me." he said, "Coming back from the ACL injury was doubly hard for me. Your first NHL practice you're just trying to get your legs going and I only had a leg and a half I guess but it was still lots of fun." Cowen had 21 points at the time of his injury last season. This year he is adding points at a higher rate and currently has 14 through 20 games. The team underwent a few changes over the summer including the loss of sniper Drayson Bowman and starting netminder Dustin Tokarski. When the captain returned to the club from Ottawa's training camp, the team had changed a bit more by adding former arch-rival Kyle Beach to the fold. I asked Cowen how the former Everett Silvertips forward was fitting into the dressing room. "It's been good. When I came back he was already with the team, [Spokane] had already made the trade, so it was a pretty short adjustment period," the big defenceman smiled, "He's fit in pretty well. He's one of the boys already so it's good. He's a really good player too so he's helped us out in every area that we expected him to." As for the goaltending situation with the Chiefs, Cowen says he's not at all worried about whether James Reid is up to the task of replacing Tokarski. "He's really picked it up over the last few games here and was named the CHL Goaltender of the Week," he said, "[Reid's] been playing good and Kyle has been scoring goals so those holes have been filled pretty well so far." This year the Chiefs can't afford to have players who aren't performing their best every night. The WHL's U.S. Division might be the tightest from top to bottom in the entire league as there really is no weak sister for the others to beat up on. 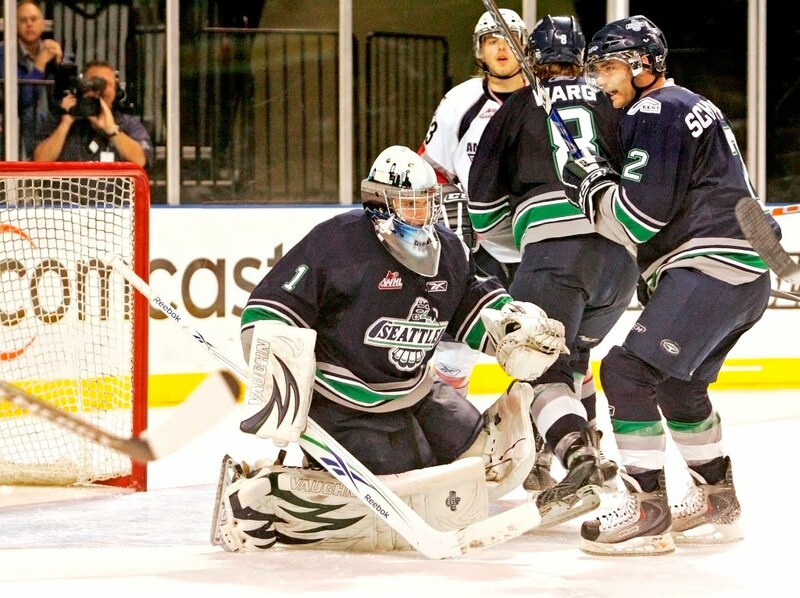 The Seattle Thunderbirds are in the cellar but can't be taken lightly just because their 22 points puts them there. Spokane is in fourth place, just 5 points up on the T-Birds and within spitting distance of second place Portland. "I think this year its one of the strongest divisions for sure," Cowen agreed, "Tri-Cities is up there again, Portland is having a good year for the first time in a long while so that's a bit of a change. We've got our work cut out for us here but it's a good challenge to have." Although his focus is clearly on the business at hand, even Cowen admits that he's looking forward to finally getting his shot at Canada's team roster the World Junior Championship. "Yeah, I've been waiting for a while now, the last couple years, to get on that squad," he said, "I think the biggest thing for me is to try and get my knee feeling as good as possible so that I'm comfortable. First up is the Subway Super Series and then after that... the waiting game." Somehow I don't think Cowen is going to have to wait long for Al Murray and Hockey Canada to call. 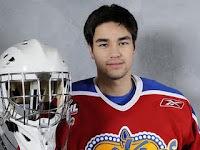 One person's misfortune is another person's big break as Edmonton Oil Kings netminder Torrie Jung has found out. With Edmonton Oilers goalie Nikolai Khabibulin unable to dress tonight for the NHL team's tilt against Chicago, the local club has signed Jung to an amateur tryout and so he'll back up Jeff Deslauriers. It might not be the NHL debut that anyone expected for Jung but he'll take it. He not likely to see a second of action but it will be quite the thrill for him regardless of his relegation to the bench. Here is the release from the Oilers. 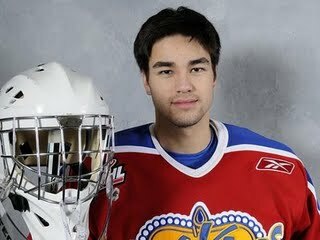 Jung was exceptional for the Oil Kings during the 2008-09 campaign and I suggested earlier this year that if he was simply as good as last season, the team would be in great shape. 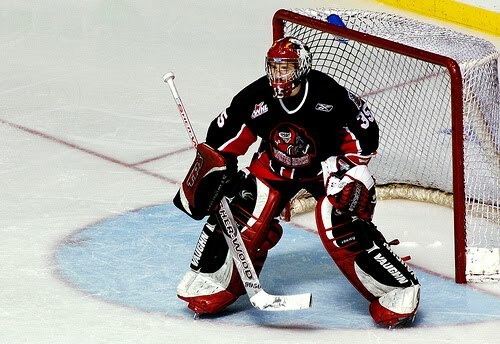 I added that if he took a natural step forward with another year under his belt and his play also reached another level, that he could legitimately challenge for the title of top goalie in the WHL. Unfortunately, he's not the top goalie in the WHL this year and one could argue that, although he has played well, he hasn't reached the same bar that he set so high last year (Stats). Illness has played a factor on some nights and so has a tougher early schedule but I'm not the only one wondering out loud whether the Oil Kings might entertain thoughts of dealing their marquee player before the trade deadline. Should Stamkos Make Olympic Team? Last year I wrote something asking if Jonathan Toews should get Olympic team consideration. With his versatility and return from injury, I can't see him not being named to the team. he now has 14 goals and 22 points, tying him for 15th in league scoring, and 10th among Canadian skaters. He's red hot right now with 11 goals and 4 helpers in his last 13 games. I know your first question will be, who does Stamkos replace if he's going to play centre? Well noone, but he doesn't have to play down the middle. He's smart, fast, and skilled. I'm not saying he should be a lock for the team, but Canada can't ignore young stars like they did in 2006 when Sidney Crosby was left off the squad. Stamkos was one of the names brought up quite a bit this summer when I was at the Olympic orientation camp. Steve Yzerman was apparently watching him play the Ducks tonight and has to be impressed with the start. At the very least the sophomore deserves to make the taxi squad, if it exists this season. 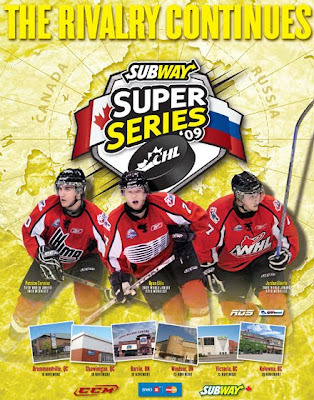 As the Subway Super Series moves from the QMJHL in OHL territory, the touring Russians carry a 0-2 record and have been out shot 99-48 and outscored 12-4. Game 3 of the Series goes tonight in Barrie, Ontario with the Russians having traveled from Shawinigan after their game against the QMJHL last night. Last week I made the argument that the event should feature the Canadian CHLers playing against their European and American counterparts from the same league. You can find my reasons for feeling that way by clicking HERE. Prior to the two games against the QMJHL I released the roster of the team I would have preferred to see play. You can see the make up of Team Q-International HERE. WHile it was slim pickings in the QMJHL for American or Euro goalies, that's not the case with the OHL. By my count there are 9 goalies with the required passport to play for my team and I finally narrowed it down to a quartet, they can all play a period and a half. Brandon Maxwell of the Kitchener Rangers was a 6th round pick of the Colorado Avalanche last June. In 13 games with the Rangers this year he has a .916 save percentage and a 3.04 GAA. I'd have him sharing the Barrie game (tonight) with German Philipp Grubauer who plays for the Belleville Bulls. Grubauer was recently recognized as one of the top goalies available in 2010. 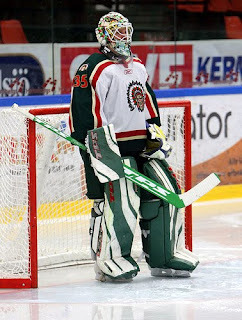 Thus far he's played in 21 games for the Bulls and boasts a .912 save percentage and .327 GAA. In the other game I would send out London Knights goalie Michael Houser, eligible for the 2010 draft by a mere two days. Houser has the third best GAA in the OHL at 2.48 but he's only appeared in 8 games. Still, his .917 save percentage suggests he's on the same pace as most of the top starters in the league. His partner on Monday night would be Robin Lehner (pictured), the Swede was taken in the 2nd by the Ottawa Senators last June. Lehner plays for the Soo Greyhounds and is in the OHL top 10 for both save percentage and GAA. There are a few obvious choices for the blueline starting with 2010 marquee prospect Cam Fowler. The American plays for the powerful Windsor Spitfires and leads the OHL in scoring by defencemen with 29 points in 25 games. Fowler (pictured below) is listed a 6'2 and 190 lbs and is a surefire top 5 pick this June. 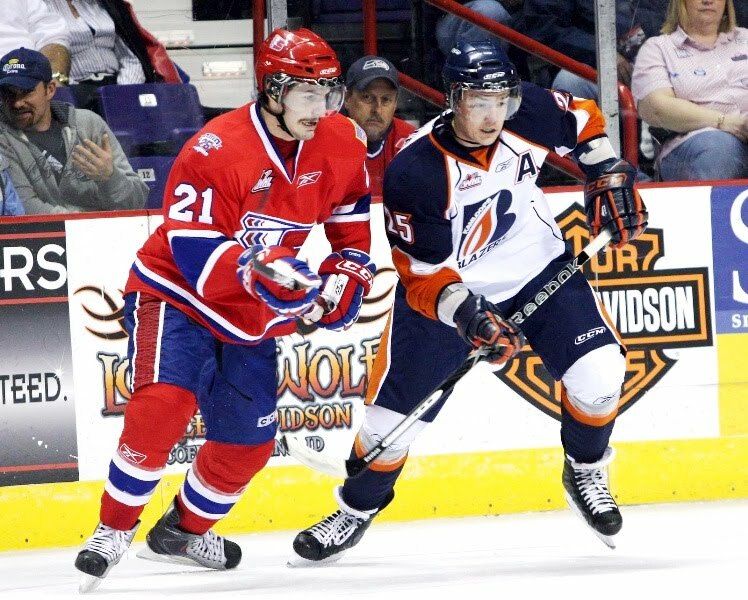 2009 guest blogger John Moore made the move from the USHL to the OHL this summer and now plays for the Kitchener Rangers. After arriving late from Columbus Blue Jackets camp (1st round pick, 2009) Moore finally got into action and has collected 12 points in 19 games. Adam Comrie was a 2008 selection of the Florida Panthers. 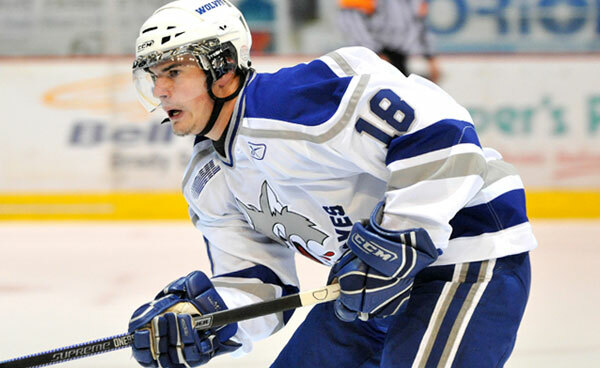 The Virginia born blueliners is now a member of the Guelph Storm after two seasons in Saginaw. HIs 17 points in 22 games with the Storm have Comrie ranked 10th in D-men scoring in the league this year. At 6'4 and 213 lbs, Comrie is definitely an interesting player to watch for in the future. 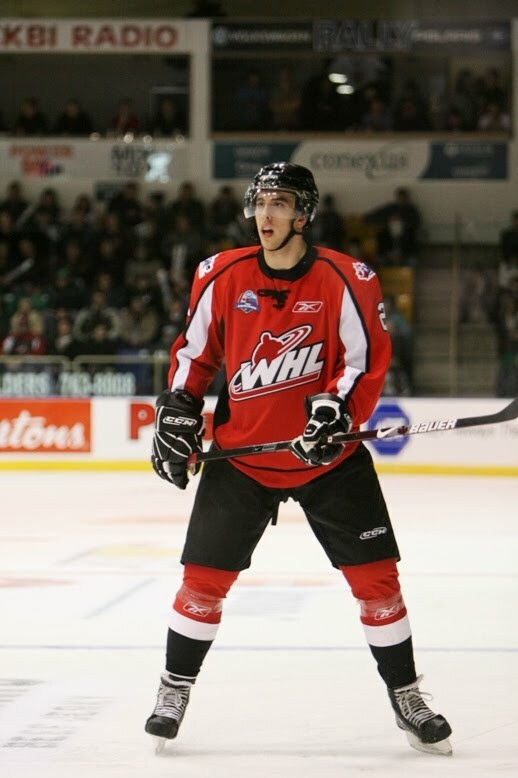 Another 2008 draftee is Michal Jordan of the Plymouth Whalers. Carolina chose the Czech native in the 4th round that year and he responded by nearly doubling his statistical output to a total of 42 points last season. Jordan has international experience with his country's junior team and even made my proposed team last year in this same exercise. Undrafted Brian Lashoff gets a nod here as a 6'3, 204 lb two-way defender. Lashoff plays for the Kingston Frontenacs but also appeared in 6 AHL games last year with the Grand Rapids Griffins (DET) where he managed to pick up 5 points. Lashoff has 10 points so far this year with the Frontenacs. Another undrafted player that caught my eye is Tony DeHart of the Oshawa Generals. With 21 points in 22 games, DeHart has already almost equaled his output from all 67 games last season. He is in his fourth OHL campaign but his first two years in London saw him play sparingly and contribute just 9 points over 72 games. The Missouri product easily eclipse that mark last year playing with the Generals and is well on his way to having a banner season. The first of my two spares on my team are going to be Sarnia Sting defender Joe Rogalski, a late '91 born player from Lancaster, New York who has 14 points in 23 games this year. 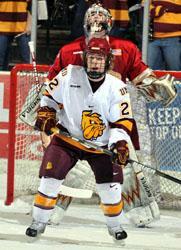 The second is native Pennsylvanian Tyler Hostetter who plays in his home State for the Erie Otters. 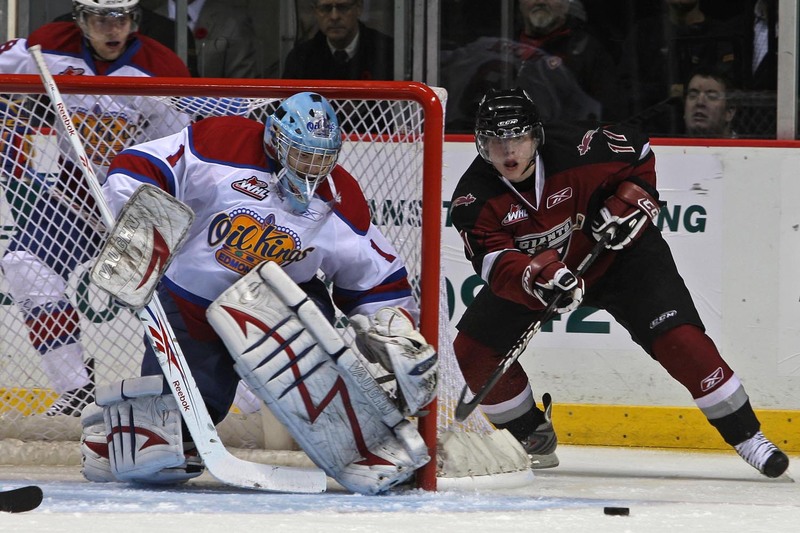 Hostetter has is a bit undersized, went undrafted last year but has 14 points in 20 games this season for the Otters. As we often see with "All-Star" teams, I'm going to have excess centers where one or two will have to move to the wing. For that reason, I only have 3 natural left wingers on my list. The first is Mississauga's Swedish import William Wallen. The tiny forward has 20 points, just two back of his total from last year when he was a rookie with the Majors. He's 5'8 and 170 lbs so I don't know how much of a pro future he has... just another reason why an event like I'm proposing is an interesting one for these types of players. Rookie Jeremy Morin of the Kitchener Rangers is someone most people will recognize as a 2nd round pick of the Atlanta Thrashers at last June's NHL draft. Morin has an impressive 27 points in 21 games, third best on the strong Kitchener team. The New York product was a standout on the US-NTDP for the past two years. A.J. 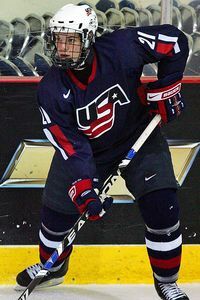 Jenks was a 2008 draft pick of the Florida Panthers. 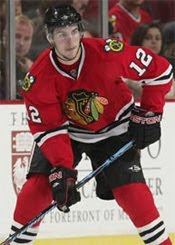 The forward is now playing in his fourth season as a member of the Plymouth Whalers in his home State of Michigan. Jenks has had back-to-back 20 goals campaigns and is on pace to make it a third. The 6'2, 200 lb power forward is projected to be a solid checker at the pro level. 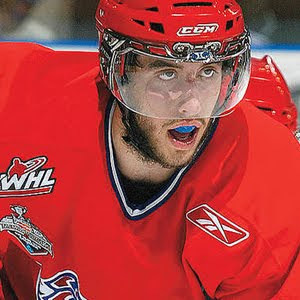 A recent guest on The Pipeline Show, Austin Watson is definitely a player of interest of for the 2010 NHL draft. He's only 9th in scoring on his own team but when that club is the Windsor Spitfires... you have to realize that 17 points is still pretty darn good. NCAA deserter Kenny Ryan found his way North to the Spitfires after leaving Boston College on the eve of their regular season. 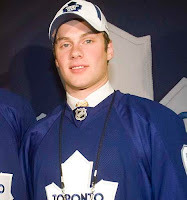 The Toronto Maple Leafs chose Ryan in the 2nd round in the 2009 draft and so far this year he has compiled 11 points in 12 contests. Brampton forward Philip Lane is a 2010 eligible rookie who makes my proposed roster. The Rochester, NY native has 11 points for the Battalion so far this year after 23 games played. rounding out the right side is another Kitchener player in Gabriel Landeskog. The Swede comes recommended by OHL Prospects writer Brock Otten who suggests the 6'1, 200lb forward was overlooked by me on my initial roster I sent his way. Landeskog has 12 points in 22 games for the Rangers. As a late '92, Landeskog isn't NHL draft eligible until 2011. So with only 7 wingers on my roster, I'll add five centers and a couple of spares who also happen to be middlemen on their OHL club team. First off are two players who will actually be taking part in the real life Subway Super Series - Russians Alex Burmistrov and Ivan Telegin. 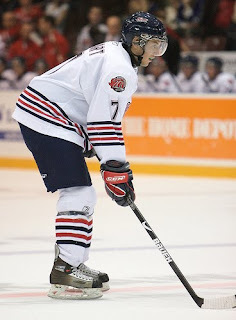 Burmistrov (pictured) is third in scoring for the Barrie Colts with 27 points but has quickly made a name for himself with scouts for the 2010 NHL draft. The dynamic pivot has a team high 18 assists to go with his 9 goals. Telegin plays for the Saginaw Spirit and has 29 points this year including 17 goals. The Saginaw forward stands 6'3 and is listed at 185 lbs. Richard Panik is another European that was drafted last June. A product of Slovakia, the skilled center currently plays for the Windsor Spitfires and has contributed 12 points in 23 games, arguably a little disappointing considering a certain amount of hype leading into the season. The Tampa Bay Lighting took Panik in the 2nd round in 2009. London Knights forwards Phil McRae and Jared Knight make the squad although I think the latter will have to be one of the spares considering his sluggish start to the season. McRae, a St. Louis Blues prospect, is just off a point-per-game pace with the Knights whereas his Michigan born teammate has just 15 points in 22 outings. 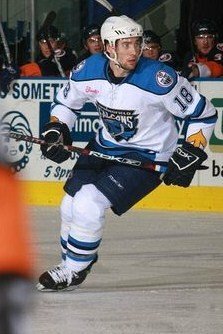 Erie forward Andrew Yogan has bounced back from serious injury late last season to have 24 points in 22 games so far in 2009-10. He's a late '91 so eligible this June and at 6'3 and 202 lbs you know he'll have plenty of eyes on him. Finally, I've decided to include 2011 eligible Vincent Trochek of the Saginaw Sprit simply because I think he's earned it. The Pittsburgh native has 15 points as a 16-year-old rookie. Perhaps it's just a gesture for the youngster but he's the last player on my team. Nationality: USA (18), Sweden (3), Russia (2), Czech (1), Slovakia (1), Germany (1). Thanks to Brock Otten from OHL Prospects for his input. Subway Super Series... Made Better!